Enjoy free delivery and the convenience of having the tickets brought directly to your doorstep! Map out your UK travel itinerary and learn how to use the BritRail Pass from Klook to get the best experience! The pass is a good deal and easy to use. Seat reservation is recommended upon arrival to UK. Make sure to get it validated at the first station upon use. The staff is helpful at the train station to done everything for us on the first day we started to use the ticket. Nice experience. 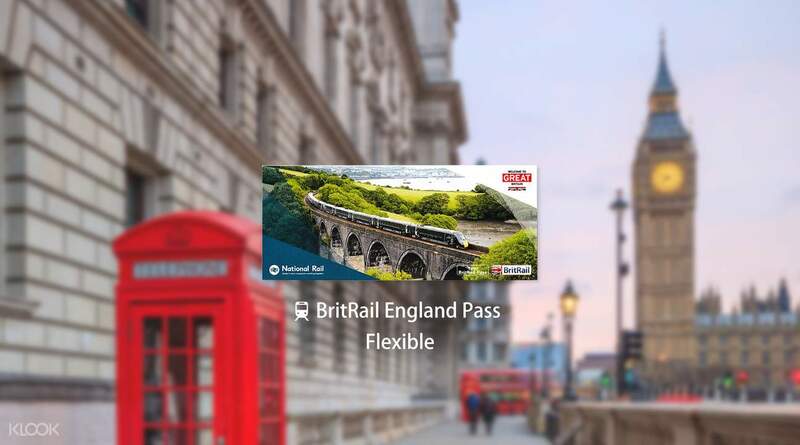 Enjoy the freedom to keep to a flexible schedule while traveling throughout England by purchasing a BritRail England Pass (Flexible)! Journey to the nine distinct regions of this beautiful country and enjoy coastal destinations like Brighton and vibrant cities including London, Manchester and Liverpool. No need to worry about purchasing multiple tickets, all you need is just one. Choose a pass that's valid for 3, 4, or 8 days within one calendar month, or 15 days within two calendar months, and just hop on and off the train as you please. You even get discounts on entrance fees to museums and popular attractions! Explore tourist spots of your choice or venture away from the bustling cities with the BritRail England Pass! The pass is a good deal and easy to use. Seat reservation is recommended upon arrival to UK. Make sure to get it validated at the first station upon use. The staff is helpful at the train station to done everything for us on the first day we started to use the ticket. Nice experience. The pass is a good deal and easy to use. Seat reservation is recommended upon arrival to UK. Make sure to get it validated at the first station upon use. The staff is helpful at the train station to done everything for us on the first day we started to use the ticket. Nice experience. Its worth it to pay some extra money to get the First Class Tickets. That was what I did and had so much personal space in the First Class cabins. There were even meals and snacks served for long haul train rides. Its worth it to pay some extra money to get the First Class Tickets. That was what I did and had so much personal space in the First Class cabins. There were even meals and snacks served for long haul train rides. Very good deal, easy to use with clear instructions! Very good deal, easy to use with clear instructions!